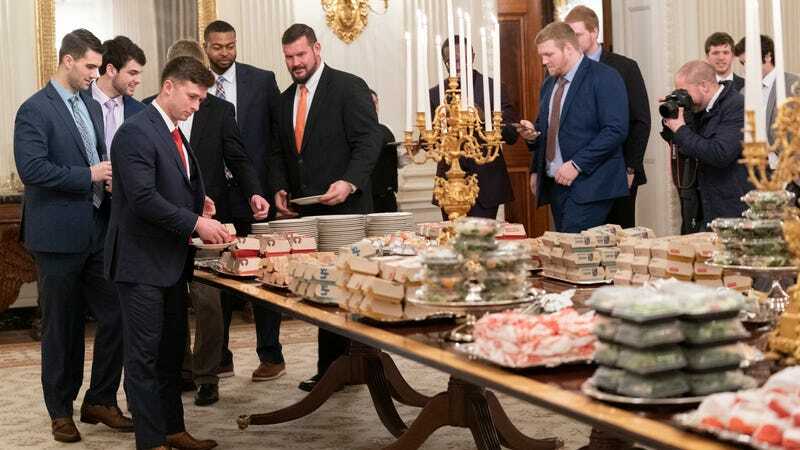 It’s been a couple days, but people still seem to be talking about the fast-food banquet President Trump fed to college football national champs the Clemson Tigers. Although the platters of likely lukewarm “hamberders” and other sandwiches appeared unappetizing to many of us on the outside, Clemson freshman quarterback Trevor Lawrence is on record calling the event “awesome” (although he says he did not proclaim it “the best meal we ever had,” as has been erroneously reported). Nevertheless a few people, including chefs, are eager to give these victorious young men a more glamorous meal. For example, Uproxx reports that hip-hop star Quavo, despite his alliance to the Georgia Bulldogs, has invited the entire Clemson team to come to the Atlanta headquarters of Quality Control, the music label he’s signed to, “to show them a proper good time and Trump how one adequately hosts some champions.” Similarly, Chicago radio station The Score reports that chefs like Ayesha Curry, restaurant execs like Nick Kokonas of Chicago’s legendary, multi-Michelin-starred Alinea, and even NFL stars like Michael Strahan are offering to feed the team (with the latter making his announcement on Good Morning America). Curry promises a “real feast” better than 10-cent dipping sauces at her restaurant International Smoke, while Kokonas isn’t even a college football fan, it’s just the principle of the whole thing. After all, these guys are champions! Lukewarm fries served in a White House paper cup certainly seems anticlimactic. They might as well milk this thing for as many memorable meals as they can get.